When I took computer science classes, there was no Star Trek or D&D posters. Just posters about Computer Science. Girls and women just didn’t want to take computer science. I remember I had been bullied about taking computers from other boys, and made fun of by girls saying if they dated me they’d be forced to go to Computer Land or something and look at boring computers. When my son was in school with his class and learning, there were more girls in his class and a woman teaching how to use computers. The only problem we had were students not doing what they are supposed to be doing and playing games on the web browser instead. I can’t visit every classroom to tell if they put up Star Trek posters or nature posters. D&D is a good way to teach how to work together as a team, it is a role-playing game where players try and solve problems together. My godmother and her husband taught me D&D when I was young. There were not as many females in D&D as there are males. D&D is sort of like The Lord of the Rings if you must know. One of my heroes, Navy Rear Admiral Grace Hopper, gave a speech on nanoseconds. Grace Hopper taught me that doing the same thing with a smaller amount of code makes it run faster, so less is more. My managers never understood why I did managed code and did extra work to make sure my code is fewer lines and ran faster, they measured our performance by how many lines of code we wrote. Women and girls had dominated programming in the 1950s and 1960s. At some point in time women gave up taking computer science, around the time that Women’s Lib came about and called working with a computer as not feminine. Women and girls just chose to study the arts instead of science. 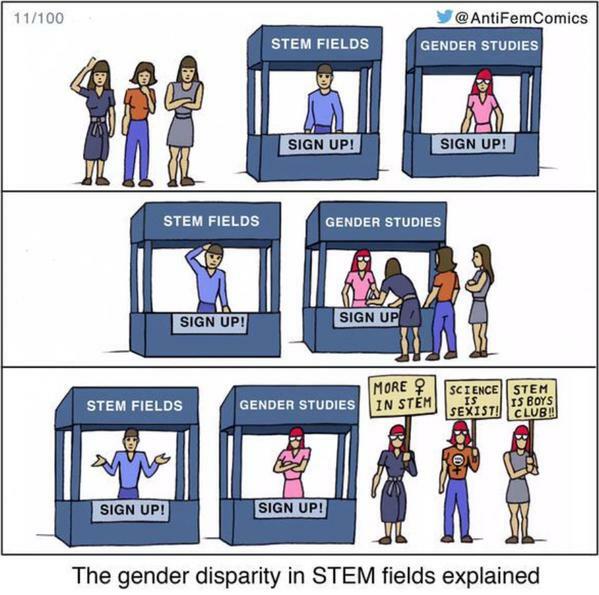 As this cartoon points out, women and girls go to study gender studies instead of STEM, and then protest STEM when it is mostly men and women only make up 18% of it. 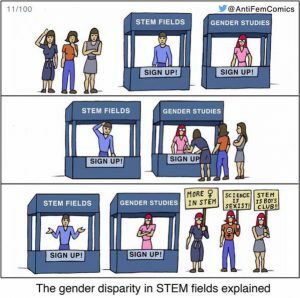 It should be 50% men and 50% women studying Computer Science (Other genders too should be represented here) and Math and Science of computer science is really hard and for Gender Studies does not require that much Math and Science. Being called a Geek or a Nerd is an insult, I don’t know if anyone remembers that growing up? I was called a Geek and Nerd, and I wanted to learn how to program a computer, and I was bullied by other boys and teased and made fun of by the girls. Telling me that computers are just a fad like the pet rock, and in 10 years they’ll be gone and there is no future in it. Now 30-40 years later computers are everywhere and easier to use. A smartphone is a computer that fits in your pocket or purse. It is more powerful than the computer that NASA used to send people to the Moon. I was beaten up by other boys for being a geek or nerd. I was not invited to parties and I was not popular for being a geek or nerd. Yet for some reason, Geek and Nerd culture is under attack by feminists, who support the bullies who bully us. They want our IT jobs that we worked decades for to get better at them, they want us gone and replaced with more diverse workers. The feminists are using hate against geeks and nerds and don’t take computer science like they should. Scared by a Star Trek posted? Scared of D&D? Need a safe place with a nature poster? Nobody ever gave me a safe space from bullies, I’d get daily beatings and name calling and I had to keep my grades up despite the distractions. Nerd and Geek culture are attacked by feminists because they are jealous of our success at IT. They want Segaration to come back because we D&D boys are distracting them with our teamwork skills and trivia knowledge of how a computer works from reading books and studying while everyone else was getting drunk at a party, or stoned, and doing who knows what. I really encourage males, females, people of any race or religion, national origin, genders, disabilities, genders, sexual orientation, etc to study computer science and show us what you can do. It is a challenge and there are all sorts of student loans and grants out there for everyone else that white males just don’t have. Even discount tuition and community colleges for reduced tuition. I may make a list sometimes just to prove how much of it is out there. Feminists will claim, wrongfully that online classes are not available and they can’t find any. We have the No Excuse List http://www.noexcuselist.com/ that they can visit and find a way to learn anything for free. Nobody knows who you are unless you tell them on the Internet. So pick something you want to learn and learn it and keep doing it until you can work in an IT department or program or design web pages whatever. Girls, women, females who study computer science, and like Star Trek and D&D are awesome. They know D&D teaches teamwork, Star Trek is about diversity, and got into computer science because it is a good field.